An Economic Mystery: Why Are Men Leaving The Workforce? Millions of men in their prime working years have dropped out since the 1960s — they aren't working or even looking for a job. Factors including technology, education and family reasons play a role. 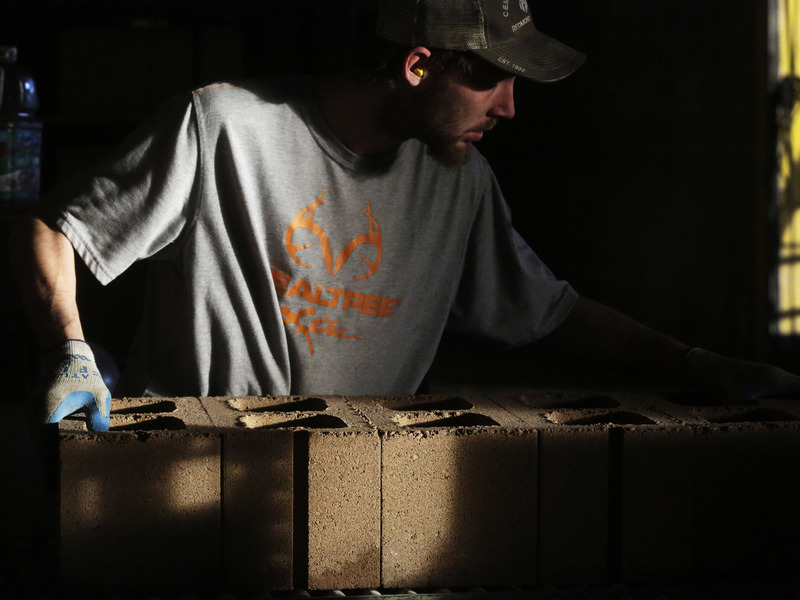 An employee moves cement blocks at the Cement Products Manufacturing Co. facility in Redmond, Ore. Millions of men in their prime working years have dropped out of the labor force since the 1960s. At 4.9 percent, the nation's unemployment rate is half of what it was at the height of the Great Recession. But that number hides a big problem: Millions of men in their prime working years have dropped out of the workforce — meaning they aren't working or even looking for a job. It's a trend that's held true for decades and has economists puzzled. In the 1960s, nearly 100 percent of men between the ages of 25 and 54 worked. That's fallen over the decades. In a recent report, President Obama's Council of Economic Advisers said 83 percent of men in the prime working ages of 25-54 who were not in the labor force had not worked in the previous year. So, essentially, 10 million men are missing from the workforce. "One in six prime-age guys has no job; it's kind of worse than it was in the depression in 1940," says Nicholas Eberstadt, an economic and demographic researcher at American Enterprise Institute who wrote the book Men Without Work: America's Invisible Crisis. He says these men aren't even counted among the jobless, because they aren't seeking work. Eberstadt says little is known about the missing men. But there are factors that make men less likely to be in the labor force — a lack of college degree, being single, or being black. So, why are men leaving? And what are they doing instead? They might be like Romeo Barnes. He lives in District Heights, Md., and his last job as a Wal-Mart greeter ended 11 years ago. He's 30, black, single and has cerebral palsy. "I have able-bodied friends who can't find work, so it's not just me," Barnes says. He says he has sought administrative jobs but that his disability and not having a college degree hold him back. "Men are traditionally known for labor work. The lower-educated guys have to do stuff like that. And that's being taken away because we have machines," he says. Indeed, economists say technology and overseas competition are displacing many jobs. The number of people collecting disability insurance, like Barnes, has also increased. AEI's Eberstadt says criminal records may also play a factor. Some 20 million Americans have felony convictions — the vast majority of whom are men. But, he says, it's hard to know how big a factor that is, because the government doesn't keep data on their employment status. "Something on the order of one out of every eight adult men has got a felony conviction, and we don't have the slightest clue as to their employment patterns," Eberstadt says. What the missing men aren't doing in large numbers is staying home to take care of family. Forty percent of nonworking women are primary caregivers; that's true of only 5 percent of men out of the workforce. But they do exist: Virginia Beach dad Jory Rekkedal quit his IT job a year ago to take care of his two girls — a gig he has loved. "I wasn't going to go back to work. It was almost going to just be a nice transition into retirement for me — a very early retirement. I mean, I'm only 36 years old," he says. And if he does go back to work, he worries about the prospects. "Things move really, really, really quick [in IT], and I'm worried that if we can't make it work, that I'm going to go looking for a job and they're going to say two years out of it, 'Sorry, brother, you don't have what it takes to work here anymore,' " Rekkedal says. Tara Sinclair, chief economist for job-search site Indeed.com, says brawny jobs are being replaced by brainy ones, and that trend doesn't favor men. "The question is, is this the new normal? Or, with the right economic conditions, the right opportunities, will those people come back into the labor market?" she says. Sinclair says if men keep exiting the workforce, that could strain the social safety net and hold back economic growth. And some, like Richard Hintzke, say they hope to go back to work. He shuttered his Detroit home-appraisal business after the housing market crashed in 2009 and considered his options. "You know, it looked like the sky was falling, so it was like, if there was ever a good time to disengage, I said, this is a good time," he says. Hintzke, who is 53 and doesn't have children, relocated to Austin, Texas, and has lived off income from investment properties. He says he misses the camaraderie he felt while working and the feeling of contributing something. These days, he's mulling a new career in holistic healing. But once you're out of work for a while, he admits, it's easy to lose momentum.